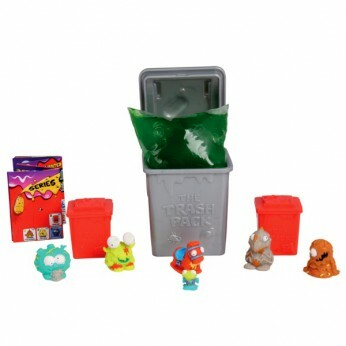 The new Trash Pack Ooze Pack provides replusive new additions to any collector’s gang! Special edition and ultra rare scrap trash may hide in this pack, so kids should be on the lookout! Liquid Ooze pack comes with 3 Toilet Bins, 6 Trashies plus a large bin full of lots of disgusting ooze to make your Trashies even more gross! Styles may vary…. Getting rid of rubbish has never been so gruesome! This Liquid Ooze Playest contains 2 bins, 6 Trashies and a large bin full of slime, eurgh! It makes it that extra bit disgusting and fun to play with. The Liquid Ooze pack comes with 2 bins, 6 Trashies plus a large bin full of lots of disgusting ooze to make them even more gross! There are over 100 new Trashies to collect in series 4, split into cool gross gangs plus loads of cool limited editions! Styles may vary; For ages 5 years and over; EAN: 8027638681168. WARNING(S): Not suitable for children under 3 years old. Only for domestic use; To be used under the direct supervision of an adult. This toy costs approximately £9.99 (for the latest and best prices make sure you check our retailer list for the The Trash Pack Liquid Ooze Pack 6 Trashies above). In our review of The Trash Pack Liquid Ooze Pack 6 Trashies we classed it as being suitable for ages 6 years, 7 years, 8 years but recommend you check the manufacturer specific advice before purchasing.